"The global peak in oil production will be the single greatest event of our generation. And I'm still surprised to find that some people fail to believe that peak oil is right around the corner." That's what I told my readers in 2007. Geophysicist M. King Hubbert delivered an infamous speech in 1956 shedding light on Peak Oil, or the point at which global oil production reaches a peak. The world has consumed a little more than a trillion barrels of the estimated three trillion barrels believed to be in the ground. Peak Oil refers to the amount of oil that can still be extracted. The more oil we pull out of the ground, the harder (and more expensive) extraction becomes. To put it a better way, we're running out of cheap, easy-to-get oil. These words still ring true today despite the full-blown oil and gas boom currently underway in Canada and the Unites States. Truth is, it's more difficult than ever before for individual investors like you to find success trading the oil and gas stocks responsible for boosting U.S. domestic production to nearly 8 million barrels per day. Take your average shale well, which can cost upwards of $12 million a piece, and only the most efficient oil and gas companies in the market will be able to effectively turn a profit. There are literally hundreds of variables that need to be precisely calculated in order to distinguish the very best energy investments in today's market. 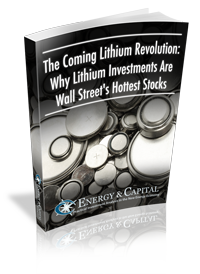 And the cutting-edge research available to the Energy Investor investment community has helped tens of thousands of individual investors make life-changing wealth from the best stocks in the energy sector. When the U.S. Department of Energy released its latest report on the world's recoverable shale oil and gas resources, the true value of these shale formations was revealed. According to that report: "Estimates indicate there are 345 billion barrels of shale oil resources and 7,299 trillion cubic feet of shale gas resources technically recoverable in the world's 137 shale formations." Energy Investor was created to take advantage of this precise situation. In fact, Energy Investor members have made money on every significant oil and gas field — including the Eagle Ford Shale in South Texas, the Haynesville Shale in Louisiana, the Marcellus Shale in Pennsylvania, the massive Oil Sands deposits in Northern Alberta, and of course, North Dakota's Bakken Shale Formation. Our companies reflect the latest in exploration and drilling technology, and will play a critical role in supplying the world with its future energy needs. Join us for the profit ride as we discover and invest in these up-and-coming companies on the cutting edge of helping energy supply meet demand. If you're still hesitant to join, take a look at our latest report regarding an ingenious natural gas play.